In the middle of Chicago’s winter Restaurant Week, which runs until Feb. 7, restaurants were choosing to stay closed rather than have employees and customers face the historically low temperatures, which were expected to fall past minus 20 degrees. As of Tuesday evening, more than 150 Chicago-area restaurants decided to close on Wednesday and reopen Thursday. According to a list compiled by Eater, closures included: Acadia, Gaslight Bar and Grille, Magnolia Bakery, all Chicagoland locations of Wow Bao except Water Tower Place, Kitsune, all locations of Blaze Pizza and Revival Food Hall. Dan Salls, owner of Quiote restaurant in Chicago and adjacent bar Todos Santos, said both operations will be closed on Wednesday, and he planned to keep an eye on forecasts for the rest of the week. The decision, he said, was largely based on concern for the safety of his 40 employees as well as guests. As he spoke by phone, he said he was carrying the trash out to the restaurant dumpster for just 30 seconds and his beard froze. “This is life-threateningly cold,” Salls said. Salls said he made the decision four days ago — long before the avalanche of restaurant closures began to appear on social media. Quiote had to cancel a few reservations and postpone a class on mezcal, but Salls does not expect many Chicagoans to brave the streets anyway. But despite all warnings in place, some businesses will be braving the frigid winter temperatures to serve customers. Revolution Food Hall in Roseville, Minn., operated by Craveable Hospitality Group, will remain open on Wednesday. The food hall will be highlighting some of their vendors’ warmer menu items like the umami ramen dish from Canal Street Noodle Co. Delivery service will be available in some cases. Lettuce Entertain You restaurants for example, will be offering free delivery through Grubhub through Thursday for its restaurants in Chicago and Minneapolis-St. Paul, Minn. Most Chicago Wow Bao restaurants will be closed, except for the one at Water Tower Place. While Grubhub delivery drivers will be out delivering food, the third-party restaurant delivery service urged restaurants to “use their discretion” when deciding whether or not to stay open or amend their hours to ensure the safety of their staff. 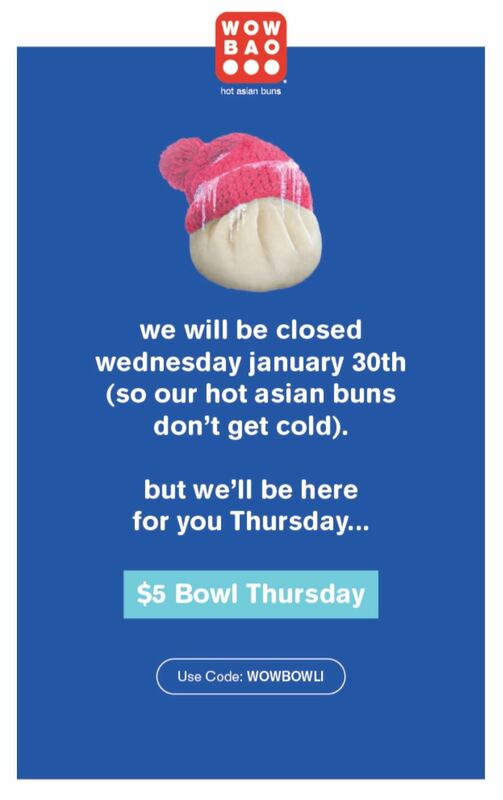 “We’re keeping an eye on the extremely cold temperatures expected tomorrow and are staying in close communication with local restaurant partners and drivers who will be potentially impacted by the severe cold,” a Grubhub spokesperson said, when reached via email.